These? These are heaven. 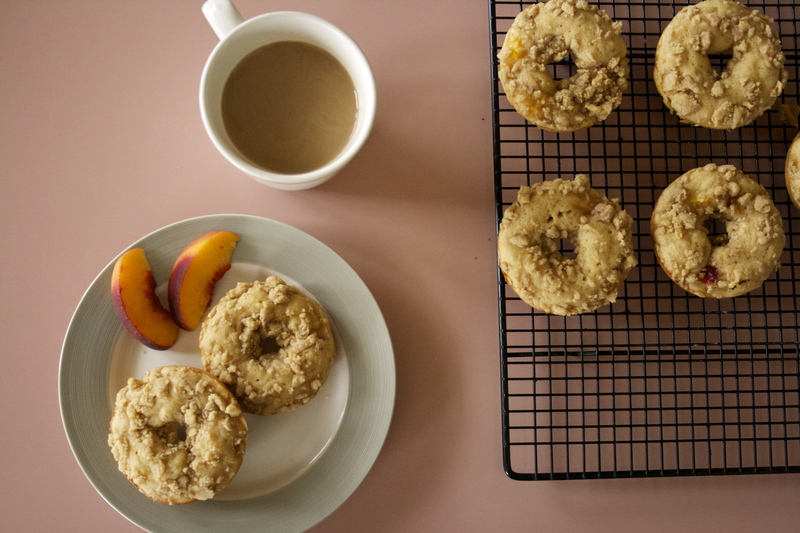 Lighter than muffins and heartier than your typical fried donuts, these scream summer breakfast. 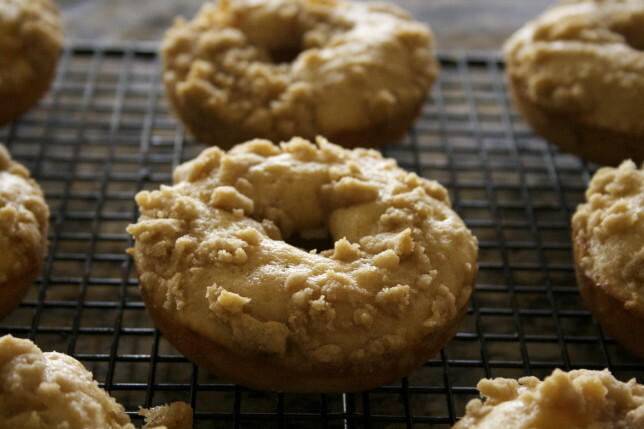 They are a combination of two of the very best rustic sweets — donuts and fruit crumble. 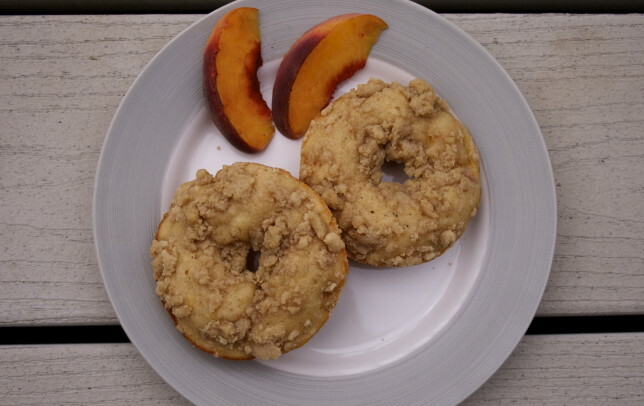 The base, made with a combination of all-purpose and whole wheat flour, is flavored with vanilla and nutmeg and peppered with diced peaches, and topped with a crunchy, cinnamon-hinted streusel. The result is an incredibly moist, tender confection made only better with a cup of coffee. 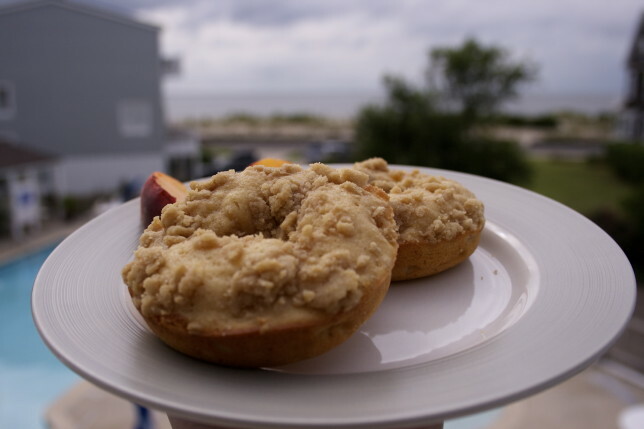 We ate these on the balcony of our rented condo, across from the ocean, as the clouds parted after a night of heavy rain and the humidity settled once again. And for once, that humidity was okay. And maybe it was these donuts that gave me the courage to face my fear later that day. These things work in tandem, it would seem. All I know is that when the next wave comes, taller than me, bigger than me, more powerful than me, threatening to topple me from where I stand, I know what to do. I’m ready to be with it and of it. Work it into something I love. Work it into myself. Are you ready to duck? These donuts are everything a baked donut should be: hearty, thanks to the whole-wheat flour; full of old-fashioned flavor, thanks to the nutmeg; and light, thanks to being baked, rather than fried. The base recipe, adapted from The Fauxmartha, uses milk + vinegar rather than straight-up buttermilk, and it works beautifully. 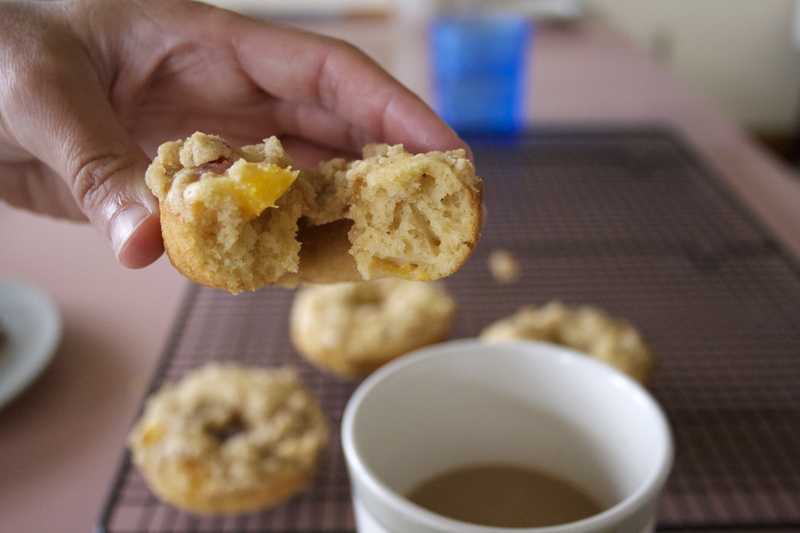 I love the way the nutmeg and the vanilla mesh with the chunks of fresh peaches, the way the slightly crunchy crumble, hinted with cinnamon, juxtaposes the fluffy donut beneath it. And I love how healthy they are — you know, for donuts. Note that you’ll probably have a little extra batter left over. Be sure not to fill the molds all the way to the top, otherwise your donuts will end up looking a lot more like muffins. Preheat oven to 400 degrees. Spray donut pans or grease them with butter. Mix milk and vinegar in a small bowl and let sit for at least 5 minutes. Meanwhile, whisk flours, baking powder, salt, and nutmeg in a medium bowl. Set aside. In a large bowl, whisk sugar, honey, egg, melted butter, and vanilla until evenly combined. Add curdled milk. Whisk dry ingredients into wet ingredients until just combined. 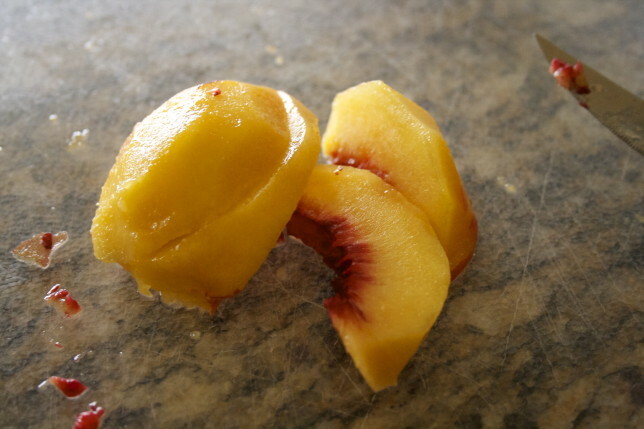 Gently fold the peaches into the batter. 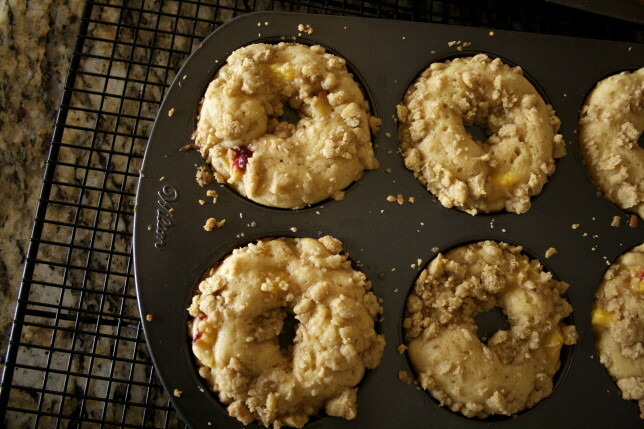 Using a pastry bag or a plastic bag with a corner cut, evenly pipe the batter into the prepared donut pans. Be careful not to overfill — the batter should not go all the way to the top. Make the crumble: In a small bowl, combine flour, sugar, brown sugar, cinnamon, salt, and butter and work with your fingers until completely combined. It should be fairly dry and crumbly, true to its name. Sprinkle evenly over the prepared donuts. Bake for 7-8 minutes, or until a toothpick inserted into the center of the one of the donuts comes out clean. Allow to cool in the pans for 5 minutes before removing to a wire rack to cool completely. Oh my goodness do these look so good. Totally bookmarking for our leftover peaches.